Okay, one last time, now pay attention. The picture below is OBSOLETE. 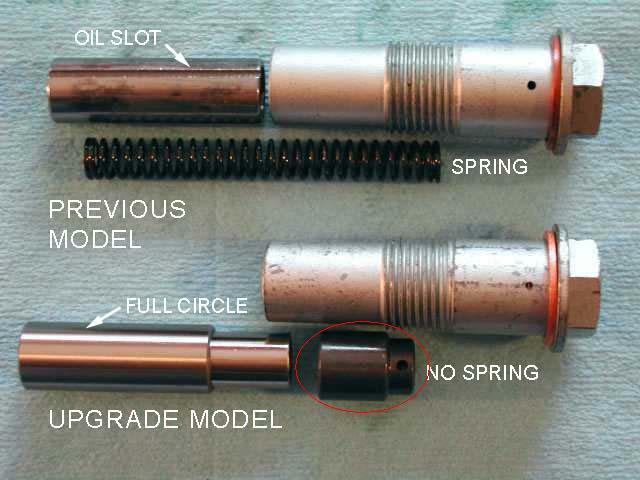 As discussed here and in the Advrider threads, the "Upgrade Model" parts below are part of a $250 discontinued "kit" from BMW that is no longer available. This picture is CURRENT AND CORRECT. The tensioner parts at the bottom are what need today. As a bonus, they're much cheaper ($55 or so). AFAIK, my original post here and my follow-up posts on Advrider are current and correct. That was the whole idea of this thread - to cut through the confusion and say exactly what you need to do on the S with the latest parts. Obviously, I failed miserably.